Bruxism is the medical term for repeated bouts of teeth grinding and jaw clenching. It might seem relatively harmless, but over time, constantly grinding and clenching your teeth together can cause serious issues and lead to irreversible damage. With 10% – 25% of the population involuntary clenching their teeth together, bruxism is very common. In this article, we will touch upon the types of bruxism, the damage teeth grinding and jaw clenching can cause, the warning signs and treatment options. 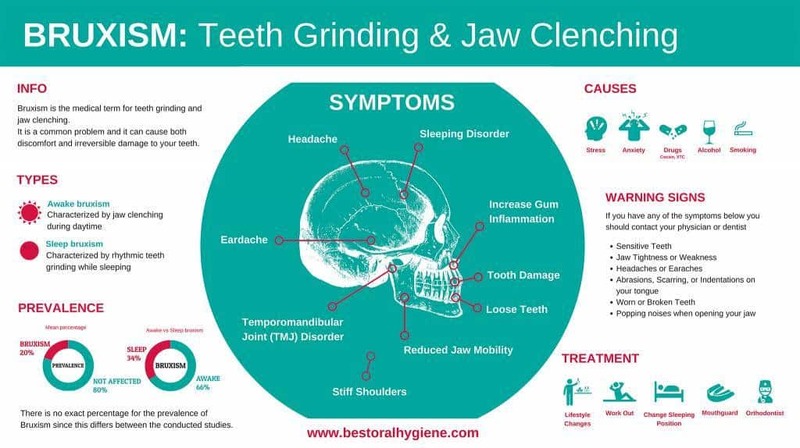 Also, make sure to check out the infographic “Bruxism: Teeth Grinding And Jaw Clenching” below! There are two main manifestations of Bruxism: Awake and sleep bruxism. Awake bruxism is characterized by the involuntary jaw clenching during the daytime, which often occurs while focussing or thinking in stressful situations. Sleep bruxism is associated with teeth grinding and contracting the jaw in a rhythmic fashion while sleeping. Grinding your teeth at night is almost always associated with other issues. For instance, Sleep Apnoea and sleepwalking are associated with teeth grinding, but it is most commonly associated with stress and anxiety. For those who clench their jaw and grind their teeth, about 70% say they are experiencing stress or anxiety during the daytime. Probably in line with work-related stress, bruxism is most commonly seen in people in the age of 25 and 45. Your habits also affect bruxism. The use of drugs like extasy and cocaine, and regular alcohol and tobacco usage, increase the risk of bruxism. You might think that teeth grinding is a relatively harmless “habit”, but it can cause serious problems if left untreated. Constantly clenching your teeth together can damage the complicated joints in your jaw, causing temporomandibular joint (TMJ) disorder. This makes it painful or difficult to move the jaw. Bruxism can also cause severe damage to your teeth. If you grind the top layers of enamel off of places, your teeth will be more susceptible to cavities. In severe cases, teeth can become so worn that root canals or replacement teeth are necessary. Tooth damage can also cause damage to the gums and bones of the mouth, causing further issues to develop. The clenching and grinding motions also put a lot of stress on the muscles of the skull and the neck. This stress can cause muscle spasms and strains, often leading to (severe) headaches. Because bruxism is normally unconscious, many people do not realize that they have this condition. Though you may not notice that you are grinding your teeth, you can still have the health problems associated with teeth grinding. If you are experiencing one or more of the symptoms mentioned below, you could be grinding your teeth and it is wise to contact your physician or dentist. One of the main causes of teeth grinding is stress. People who have anxiety disorders, anger management issues, or have excessive stress at work, are particularly prone to suffer from repetitive tooth grinding. Therefore, many people find relief from bruxism by making lifestyle changes to reduce their stress levels. Exercising, or practicing stress management techniques such as yoga or getting regular massages can be very helpful. Since most tooth grinding occurs at while sleeping, avoiding caffeine, alcohol, or smoking in the evening is recommended. Also, do not watch television just before going to bed. This will help to promote relaxation and prevent excitement right before bed. Some people also report that they have fewer issues with bruxism after changing to a different sleeping position. Though the above lifestyle changes are helpful for most people with bruxism, some individuals find that they need a more effective treatment method. There are many types of mouth guards designed to prevent your teeth from rubbing against each other. You can visit a dentist and be fitted for one of these mouth guards. Children who have bruxism often find that the condition goes away after they get braces. This happens because misaligned teeth can trigger bouts of grinding, so you may want to talk with an orthodontist to make sure that your teeth and jaw are correctly aligned. In severe cases where most other treatments do not work, Botox injections around the jaw can help to relax the jaw muscles to minimize teeth grinding. However, there concerns about the dangers of Botox. Realizing that you have bruxism is the first step in preventing irreversible damage to your teeth. Luckily, there are multiple things you can (and should) try to prevent teeth grinding. If you suspect that you may have bruxism, you should talk to your physician or dentist better sooner than later. Finally, we have created this infographic that summarizes this post. You can use the share code below to include it on your own website (a link to this post is required).